Are there revision control systems for images? I would make crazy use of such a revision control. If it doesn't exist - where would to a good starting point for building one? I can probably make a lot of designs and interaction flows, but to implement it is another thing. Would it be a good idea start by creating a macro to work with Adobe Photoshop / Illustrator? Or one of the online image editing tools? Can anyone refer me to anyone working on one of the online image editing tools? Subversion is actually pretty good for version controlling binary files. It's just about the only great strength it has over, say, Git (as far as I'm concerned, anyway). See this answer of mine for a more detailed explanation of that assertion. 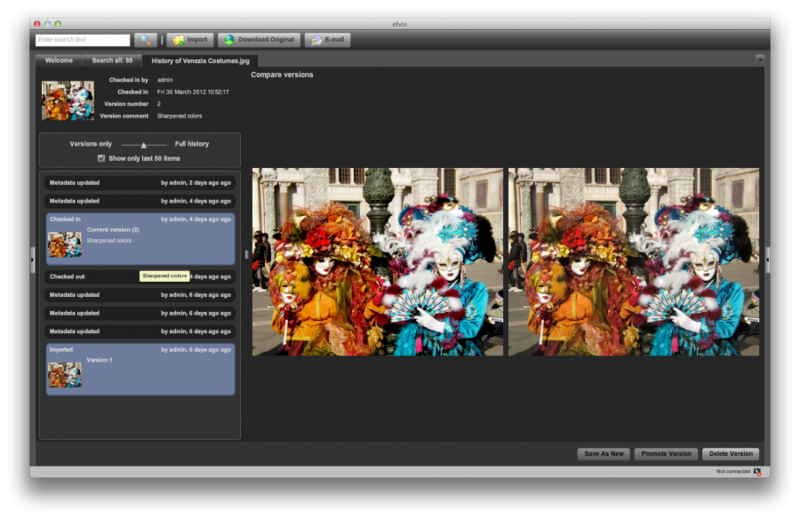 ImageMagick has a compare command that shows you the pixel-by-pixel difference between two RASTER images. Vectored images might be trickier (unless you can look at an SVG source and immediately see the resulting picture). Unfortunately this doesn't really help you with Photoshop/Illustrator though. If you're working under Windows, TortoiseSVN has an image comparison utility too. Perforce is fairly commonly used in game development where image content may be included in source control. They have invested quite a bit of effort in handling this type of content very efficiently. Oh, and apparently when used for content rather than just code, these types of tools are referenced as Digital Asset Management tools or DAMs rather than the SCM name with which most of us are familiar. Does PixelNovel count? PixelNovel is source control for Photoshop, and it looks like it's based on SVN. To be fair, it won't work outside of Photoshop and it seems to be a commercial product, but it has been done by someone, so I guess it's not too outrageous an idea. How would you propose to diff and patch images? Figure that out and we can get right on it. Does this even make sense? Is someone ever editing the upper left corner of an image while someone else is editing the lower right? If you just want to see different "versions" of images with the same filename, that's trivial. Would get rather expensive on storage though. 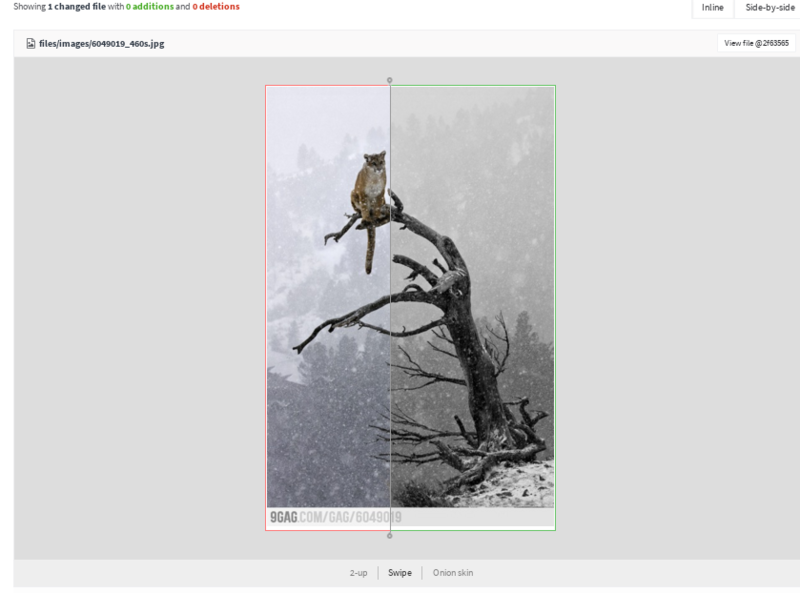 GitLab supports image comparison with a web based slider tool and onion skin tool. This is a good option to manage images and other types of files in the same place. Most revision control systems support binaries. You could easily use SVN or GIT to store binaries, i.e. pictures in. I was thinking about this for PhotoShop recently and I think the way to go it would be to store the command stack or a variation of it. How this could be done I don't know. Presumably a plugin could access this data. Crazy Idea but what if you were to record an action (if you are in Photoshop obviously), for every image that you work on. Then you could simply play the action back on the original image and voilà! This requires some forethought in pressing 'Record Action' when starting editing.. but I'm sure a plugin could be rigged to do it for you. It's a starting point though. Version control for images and any other type of "rich" content is usually referred as Digital Asset Management (DAM) system. These are typically more business type applications and not more like subversion. However, most of these system support versioning and metadata assignment to images. How easy to use and how integrated these systems are the questions that should be answered. I would say any of these DAM systems would be competing with your old habit of saving your file onto the network share as it is so easy to do that. However, these systems are actually design for collaboration and long term preservation. One good DAM system is Elvis DAM since it has a desktop client that supports drag and drop type of operations and it also has direct integration into Adobe Creative suite. It won't do a diff for your versions but you can actually see the versions side by side with all changes to data. In general, you should investigate tools that provide digital asset management (DAM), which is what you might consider revision control in the media world. See, for example, http://thedambook.com as a gateway to such tools. One popular tool is that mixes image editing and digital asset management is Adobe Lightroom. Adobe has been pushing the idea of recording a history of non-destructive edits and then applying them as a recipe on top of the raw camera data. You can create and name snapshots of different edited versions (perhaps a sequence of versions) and navigate between them in a visual manner. Apple Aperture may provide similar ability. Another professional tool is Canto Cumulus. These tools don't preserve the "diff"-ability that other answers seem to be focused on, nor do they necessarily provide the ability to have commit messages. But, they do allow tracking of variations and association of image files back to their original components. To manage binary formatted digital asset repositories, I use unison, and backups. I decided that managing revisions did not make sense, but being able to keep multiple repositories in-sync did, and backups are a "no-brainer". Unison gets overlooked too often, and although I discovered it about five years ago, I only recently identified it as the perfect tool for me in certain circumstances. Note however that vector images are a totally different story. SVG images can be manifested in complete plain text, where revision management would make perfect sense. It provides a mechanism to provide version control on images. For minor changes on images, instead of forming a whole new image, a compressed form of change will be appended to the original image. Not the answer you're looking for? Browse other questions tagged version-control image image-processing revision or ask your own question.